Bebbington is a well-respected British historian. He has written a few books on the topic of evangelicalism in Great Britain and in America. This volume is an attempt to put into writing what he has taught on numerous occasions. Bebbington takes the reader through several topics driving toward an understanding of what it means to be a Baptist. 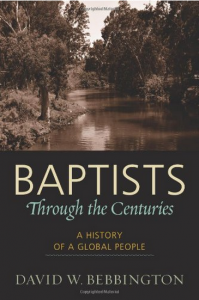 Bebbington argues that Baptists originally had three main ideas: believer’s baptism; a regenerate, gathered church; and the ability of the Christian to self-rule. Through the centuries the Baptists have fractured over various issues such as particular vs. general redemption, evangelical cooperation, and most divisively, theological accommodation to the spirit of the age. Baptists have grown internationally and have been shaped by and are shaping culture. Bebbington argues that the three main ideas of Baptists do not characterize all who would call themselves Baptist while also excluding those who are not Baptist. Bebbington’s conclusion, then, is that Baptist identity “may elude definition. It is perhaps enough that, over the generations, Baptists have conscientiously attempted, with varying degrees of success, to embody the gospel in their cultures” (285). The book is an enjoyable read in Baptist history, theology, and historiography. I would counter-argue that Baptist identity can be found in those original Baptist ideas such as believer’s Baptism, regenerate church membership, and soul liberty. These Baptist ideas are important and are the center of our heritage.